The 100th race under the Xfinity banner was the closest in NASCAR national series history. 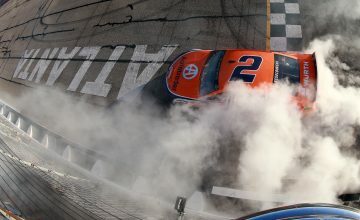 Tyler Reddick won the PowerShare QQQ 300 by an official delta of 0.000 seconds over his teammate Elliott Sadler. Photo by Jonathan McCoy. Elliott Sadler finished second after over coming a locked-bumper penalty for which he and Chase Elliott were charged. It wasn’t that Sadler raced his way back to the front though, as the end of the race was marred by half a dozen yellow flags. 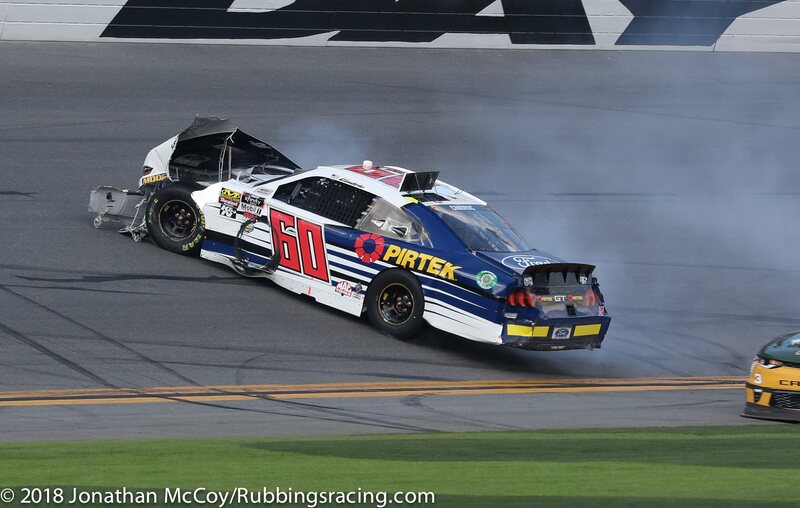 Wreck after wreck after wreck after wreck – such was the end of the PowerShare QQQ 300 at Daytona International speedway, suddenly Elliott was back in the top-ten despite being the culprit of one of the original overtime cautions. Running as the leader, Daniel Suarez ran out of gas under caution on lap 127, by this time fuel was a concern for everyone. “Save save save” became a rite of passage for the crew chiefs lucky enough to still be in contention. Caution laps helped with this issue, but when two more yellow flags waved NASCAR opted to red flag the race to avert a plethora of cars running out of fuel. The red flag lasted five minutes 27 seconds, when the race went back green it was raced clean to the finish. Sadler restarted behind his teammate, Reddick. 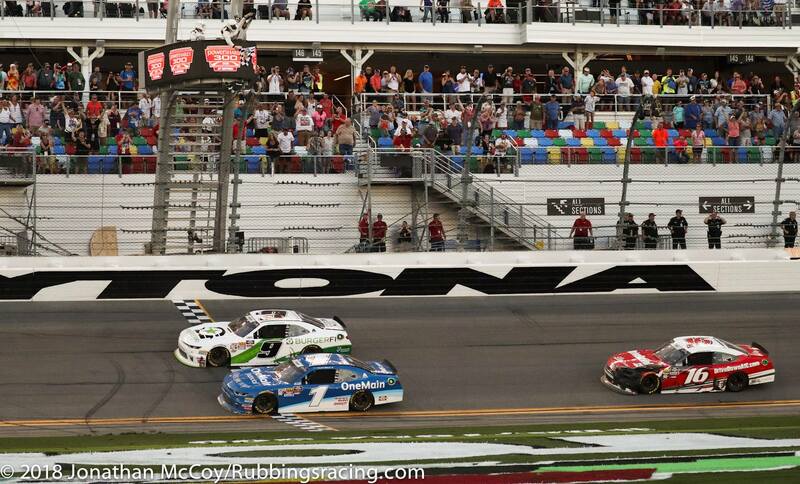 With a strong push the Jr. Motorsports drivers surged to a single-file two car lead, the race was on from there. Sadler’s game was to back away from his teammate and then use the draft to build up momentum for a would-be race winning pass, Reddick’s chess match was to not afford Sadler the necessary separation while also not slowing so much the pack would overtake them. Going down the backstretch Reddick was forced to throw blocks to his left and right, he staved off one attempt from another driver but was unable to keep Salder from getting to his inside. Immediately Reddick side-drafted his teammate, keeping both cars contained within each other’s momentum. The pair of teammates stayed side-by-side through turns three and four, one driver would drop air on the other’s spoiler and wheel well but then the other would do the same before they could separate from the air’s wake. At the finish line it was a dead heat. The race that would run 57.5 miles beyond it’s advertised distance begin with a quick tempo small dose of calamity. Coming off turn four on the tenth lap of the race Austin Cindric got loose in the middle of a three-wide pack of cars. He went to correct his fish-tailing car but over corrected, bringing about an eight car wreck. The mistake would take him, as well as Christopher Bell out of the race. Austin Cindric’s car skids to a rest along the front stretch. Photo by Jonathan McCoy. The leaders, drove an aggressive race from the onset. Hard blocks and tight side-drafts were the bread and butter of Saturday’s classic. Though the on track driving was relentless, no accident slowed the race again until lap 100. Entering turn-three Reed throw what NASCAR deemed to be an overtly aggressive block on Ryan Truex, brother of reigning Monster Energy NASCAR Cup Series champion Martin Truex Jr., was forced below the yellow line and left no room to blend back onto the racing surface before reaching the 31-degree banked turn. Staying up on the wheel, Truex was able keep his car straight but the conjoined shuffling of other cars created another eight car pile up. No more than three full laps of racing would be completed henceforth. On lap 107 two cars spun through the tri-oval grass, a similar incident occurred five laps later. 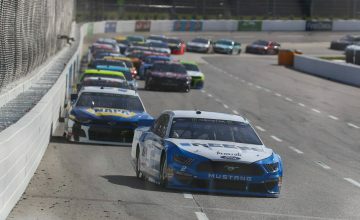 With two laps to go, lap 119 Elliott Sadler spun off turn-two but saved his car from any damage – despite there being no impact, debris, or general reason to fear for on-track safety NASCAR opted to throw the yellow flag. 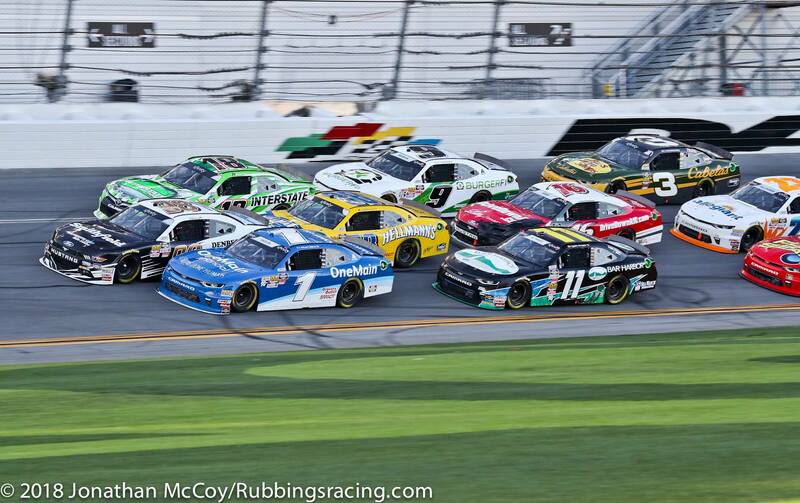 In was pack racing from start to finish in the NASCAR Xfinity Series season opener. Photo by Jonathan McCoy. Overtime #1: Cup drivers, Kyle Larson, Joey Logano, and Aric Almirola pin-balled between each other’s front and rear bumpers until the veteran MENCS drivers lost control. Their mistakes created NASCAR’S quintessential wreck, the big one. In total 18 cars would be involved in the track-blocking wreck. Overtime #2: Spencer Gallagher spun into the inside wall along the backstretch. Overtime #3: Ryan Ellis and Kyle Larson tangled immediately after taking the green flag. Overtime #4: Dylan Lupton had a parts failure. He careened head on into the backstretch wall. Overtime #5: They actually raced clean to the checkered flag.